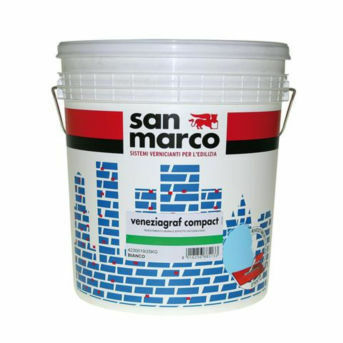 Acrylic resin wallcovering / home / embossed / exterior - VENEZIAGRAF COMPACT - Colorificio San Marco S.p.A.
Flooring & Wallcovering > Wallpaper, Decorative panel > Resin wallcovering > Colorificio San Marco S.p.A.
VENEZIAGRAF COMPACT Colorificio San Marco S.p.A.
VENEZIAGRAF COMPACT is an external wall finish, based on an acrylic binder, which further to delivering a plaster like effect, due to its’ granulometric curve, has filling and masking capacity which smoothes out irregularities in the support. It delivers a finish very similar to that of mineral plasters and may be applied where the support is ugly or uneven. VENEZIAGRAF COMPACT creates a rough layer of notable depth resistant to the aggression of atmospheric agents. The product is particularly indicated for renovation work.